studioJGco has been providing creative and results driven web solutions for corporations, organizations, and higher education since 2004. We successfully showcase businesses and organizations on the web by combining our experience in design, development, and marketing with each client’s expertise and vision of success. Our experts work directly with your experts in partnership. The award-winning company has grown from a single graphic designer to include web and marketing professionals with experience and passion in all things web. From design and new development technologies, to search engine marketing and overall web strategies, we create all-inclusive web solutions to help clients be successful in an ever changing landscape. Right from the start, we’ll deliver clear communication, timeliness, and honesty. With every project and with every new client, a lasting relationship is built to forge new ideas for the future. 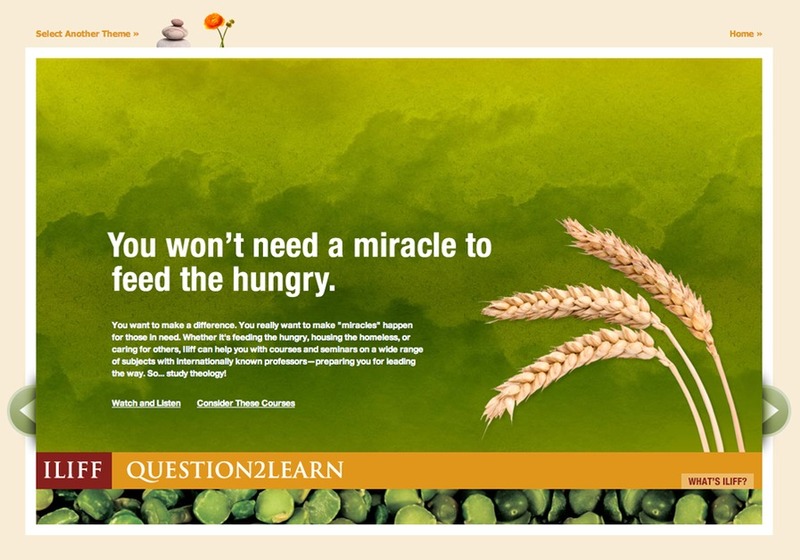 Iliff School of Theology's Question2Learn campaign to attract new graduate students featured this engaging microsite as a landing for their 2010 outdoor advertising campaign.